We were just transferred. Yes, it felt fast for me too. It feels like we just went from first class to the luggage compartment. 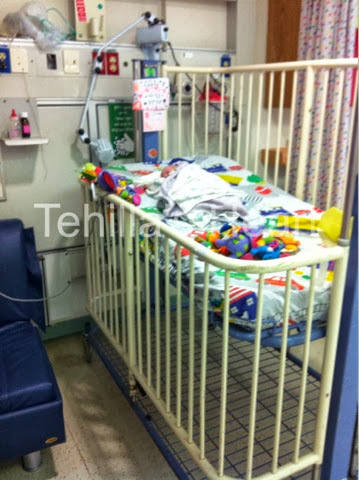 Before Tehilla had her own room with a nurse that we sometimes shared with another room and a full staff of doctors constantly attending to her and up to 7 other patients. I had my own little room outside of the PICU with a bed, closet and night table. We are now in a great big communal room with 7 other patients and 2 nurses separated only by curtains. I have a pull out chair/bed, next to her. There is no privacy and there is constant noise. We have been reunited with a "sunshine" of a child that we had the "pleasure" of meeting in the PICU. This boy spits out his medicine, pulls out his IVs and screams from dawn until dusk. Before there was a door. Eizeh Yofi!!! May you bring home a happy healthy Tehilla, soon! You must be beyond exhaustion, you have been through so many "ups and downs" -- but remember that this is good news! Tehilla was strong enough to transfer to this level of care which is wonderful news! Best news yet -- she may be going home in a week! B"H! !